Well done to everyone who took part in the Gloucester Hasler at the weekend. George Carn and Katie Brookes won the Div5 K2 race, while Matt Howard gained promotion to Div6 after finishing 3rd in the Div7 K1 race. 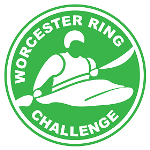 Andy Nevitt and Dave Walsh finished 4th in the Div5 K2, while Ian Smith fought his way back up to 7th place in Div3 after taking a dip in the choppy Gloucester & Sharpness Canal. Hasler Final … a triumph! A huge thank you to all our volunteers from both Worcester and Gailey who made today’s Hasler Final such a tremendous success. Special thanks go of course to Fess for organising the whole event and for all his efforts leading up to today! On the water we had some great results too …. Well done to all our other paddlers who did fantastically well too …. Mike Hawthorn (26th Div4 K1), Sue Hawthorn & Mike Fudger (12th Div4 K2), Pascal Bauer & Kieron Killey (15th Div4 K2), Tony Machin & Jurgen Bauer (16th Div4 K2), Matt Wooliscroft (21st Div5 K1), Andy Nevitt (28th Div5 K1), Katie Brookes & Chris Skellern (20th Div5 K2), Rob Welford & Steve Hutchinson (11th Div7 K2) and Robin Powell (27th Div9 K1).